In 2013, I wrote an article for Performers magazine: Out, Loud and Proud: Queer in the Biz. In five years much has changed, including the formation of an LGBTQ+ committee at ACTRA Toronto: outACTRAto. A number of cultural shifts have occurred — a rising transgender movement, changes to the way we talk about our variety, like ‘cisgendered’ and ‘non-binary’ and other expressions that move beyond the two-gendered binary. I, too, now refer to myself as a non-binary lesbian. Our LGBTQ+ community has made some great strides. We are engaging in inclusive and diverse conversations culturally on race, sexuality, ability, belief, and, yes, gender. With the rise of the #MeToo movement, we have also seen enormous efforts by people all over the world to address issues of violence, gender violence, and sexual assault. We are grappling with political changes and global concerns that affect and impact us all. And in the face of these challenges and changes, we still see so much hope and passion — from youth marching for an end to violence; to women marching everywhere for equity, parity, visibility, an end to sexual harassment and objectification; to black rights marches; and human rights rallies all over the world. Our industry is not immune. We have faced great challenges over the last year, and, as a result, have seen some great changes, including the birth of our LGBTQ+ committee. At outACTRAto, we want to elevate the conversation about LGBTQ+ stories. We want to see reflections of who we are on big and small screens, and we want and need allies. We need screenwriters, producers, directors, and casting directors to get on board, to be open to new realities and authentic reflections of our incredibly diverse and awesome community across cultures, races, genders, and sexualities. Since then, we have seen shows like Transparent, The Chi, Pose, Orange is the New Black, Carmilla (And Modern Family is still on!). Queer content is on the rise through streamers like Netflix, Hulu, Amazon and YouTube, to name a few. But we are still limited as performers in our choices and opportunities, still have only marginal representation on screen and film, and many performers are still in the closet, afraid to come out through fear of losing income, family and friends. We still have so much to do. Predominantly white, male, heterosexual filmmakers, showrunners, directors, writers and producers remain in positions of power, telling the stories that culture consumes, that continue to render many of us invisible. Sexism, racism, homophobia, and ableism continue to harm us. However, we believe deeply that things are changing, that this is our work now, that we must continue to speak out, write, challenge, educate, and inspire change. 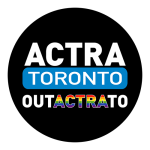 For the first time ever, the DGC recently marched alongside ACTRA Toronto in the Pride Parade, and it was the official launch of our new LGBTQ+ committee: outACTRAto. Change is happening; it may be slow, but it is happening. outACTRAto hosted a panel discussion at the fall Members Conference in September. We want to really speak about queer lives, representation, language, intersectionality, gender, race, sexuality, who tells the stories, and how we can change the stories to truly represent us, so that all children — gay or straight, black or white, male, female, non-binary or trans — can see reflections of their beautiful selves when they turn on the screen, go to a movie, browse the net, or listen to a book. We need those in power to fund projects that are equitable and diverse. And we need to rise and create content for each other and keep knocking on those doors until they open. Please visit our outACTRAto page. Take the time to fill out the survey. It can be anonymous if you like. There has been a shift. It’s still slow and it’s still difficult, but we are getting there. Know that we’ve got your backs and are doing what we can, one step at a time. Joanne Vannicola is a feminist, writer, director, and Emmy award-winning actor, Genie, Gemini and ACTRA award nominee. She is the chair of the new outACTRAto committee and dedicated to equity on and off the screen. She is committed to educating the industry around LGBTQ+ lives, performers, and the advancement and inclusion of our stories, with fair and real representation of LGBTQ+ lives.